We hope this finds you well as the sun begins to shift into autumn. 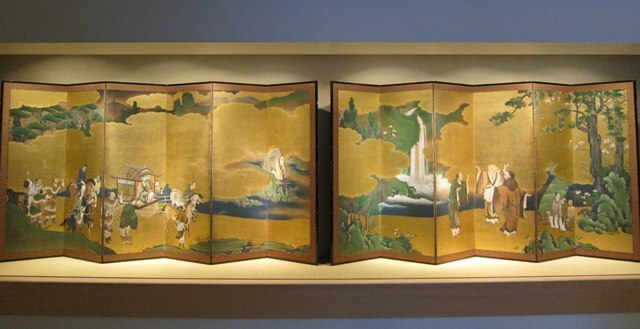 On display in Shirokane now are a pair of Kano school screen dating from the Edo period, entitled Emperor Wen Meets Fisherman Lushang ・ The Three Laughters of the Tiger Ravine. 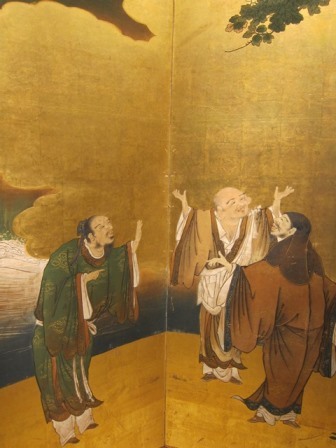 Chinese landscapes and historical tales have long been subjects of Japanese painting, the the present pair of screens is no exception. Many of these tales have perhaps shifted more toward legend than historical fact, yet have been passed down for generations. In fact, from the many stories passed down from ancient China, many have worked their way into contemporary idioms and expressions used in everyday speech and composition. First, allow us to introduce the screen on the left, Emperor Wen Meets Fisherman Lushang. 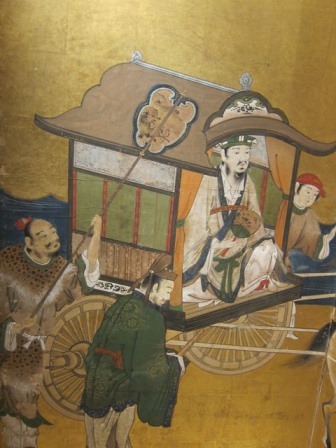 This is the scene when Zhou Dynasty (c.1046 - 256 BCE) Emperor Wen, in the carriage in the center of the screen, first meets Lushang, who can be seen fishing in the Wei river on the right. Having heard in an oracle that he would someday meet a wise man to help him establish the Zhou Dynasty, Wen followed the advice of his father and grandfather, the Grand Duke, and went in search of such a talented individual. The moment Wen saw Lushang, he knew without doubt he was an extraordinary man. After speaking with him for a while Wen confirmed that Lushang, this old, white-haired fisherman, was in fact not only an able political thinker, but a great military strategist as well. Knowing this was exactly the man his grandfather had longed to find to help them establish a new dynasty, he brought him back to their mansion, appointed him a cabinet minister, and named him Tai Gong Wang, meaning "the man the Grand Duke had hoped for." Today, in Shaanxi, China, the place where Tai Gong Wang is said to have fished is a popular tourist destination. And in Japan, people who like to fish are sometimes called "Taikōbō", which is the Japanese pronunciation of Tai Gong Wang. Next, I would like to introduce The Three Laughters of the Tiger Ravine. In the center of the composition, three men are standing together engaged in a friendly discussion. Of the three, the famed monk Hui-yüan, founder of China's Pure Land sect of Buddhism on Mount Lu, pledged never to leave the monastery there. One day, he was visited by two friends, the poet T'ao Yüan-ming, and the Taoist scholar Liu Hsiu-ching. 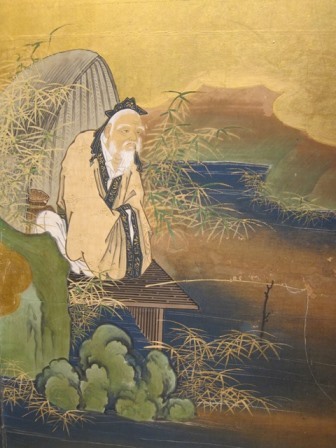 At the end of their visit, Hui-yüan saw them on their way, but became so lost in conversation as they walked together that he suddenly realized they had crossed the bridge at the foot of the mountain over the Tiger Ravine, going beyond the monastery's grounds, which he had pledged never to do. It was the roar of a tiger that snapped them out of their trance, and upon realizing where they were, the three friends burst into laughter. Beyond merely looking at these paintings, it is understanding the content of the stories being told that really draws you in, and turns the viewing experience into something far more meaningful. These screens are on display until Saturday the 28th, and we hope you will take the time to come by and see them.